Watermelon is one of our favorite themes to explore during summer- and it’s at the top of our list for summertime treats too! 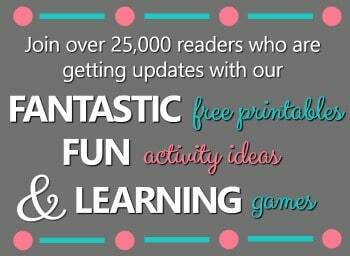 We’ve been having fun reading lots of watermelon themed books and creating watermelon crafts and sensory bins. 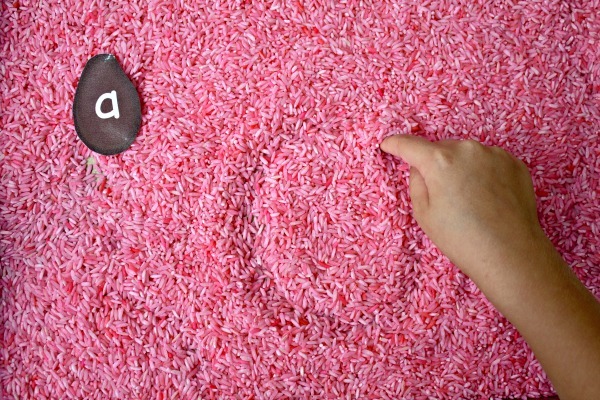 We recently created a fun and hands-on way to involve the senses when writing. 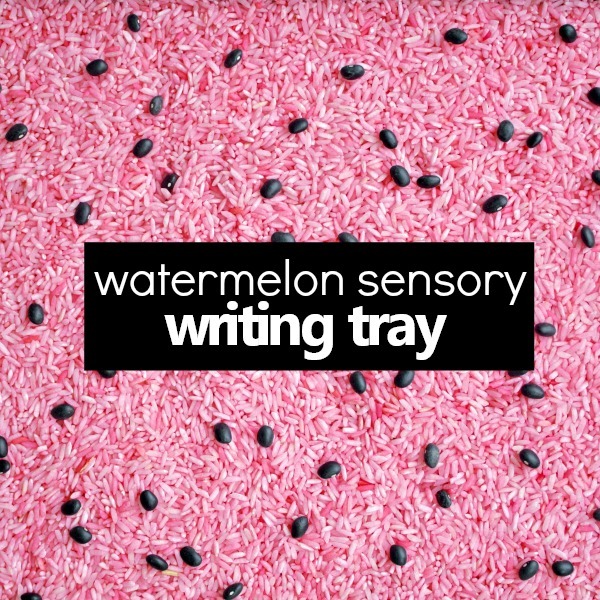 By adding rice that’s been dyed pink to a shallow tray and some black beans to represent the watermelon seeds, you can create a watermelon sensory writing tray. This watermelon writing tray is a great way to extend practicing writing letters or even sight words for early learners. Want even more watermelon theme ideas? 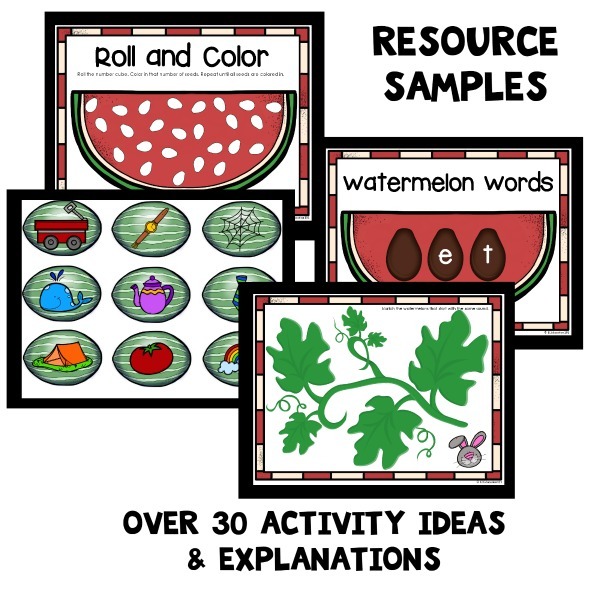 Continue the fun with a full week of watermelon play and learning with our printable lesson plans for home preschool and preschool classrooms. 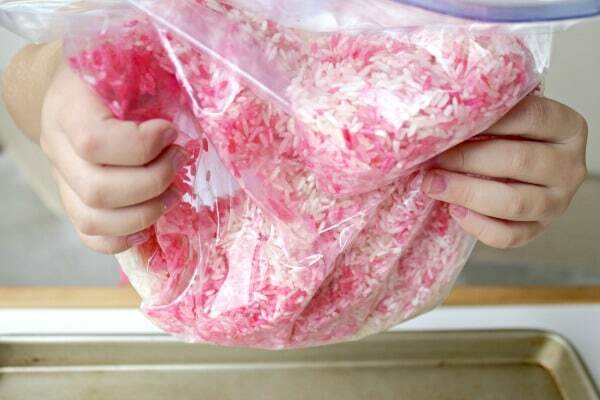 Pour rice into a large freezer bag. (We used 2 cups of rice which covered the baking pan nicely). Using a one to one ratio, add one tablespoon of vinegar to each cup of rice used. 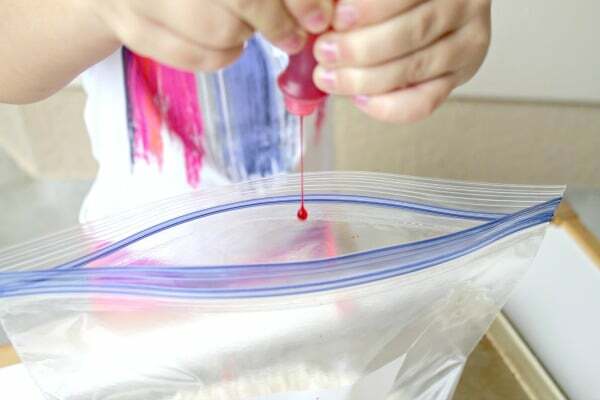 Add food coloring to bag. (We added 5-7 drops). Set out in sun for one hour to dry. (You may speed up the dry time to about 15 minutes by placing the rice in a pan in the oven on a low heat and monitoring frequently). Once your rice is dry, add it to your shallow pan and sift around to cover evenly. 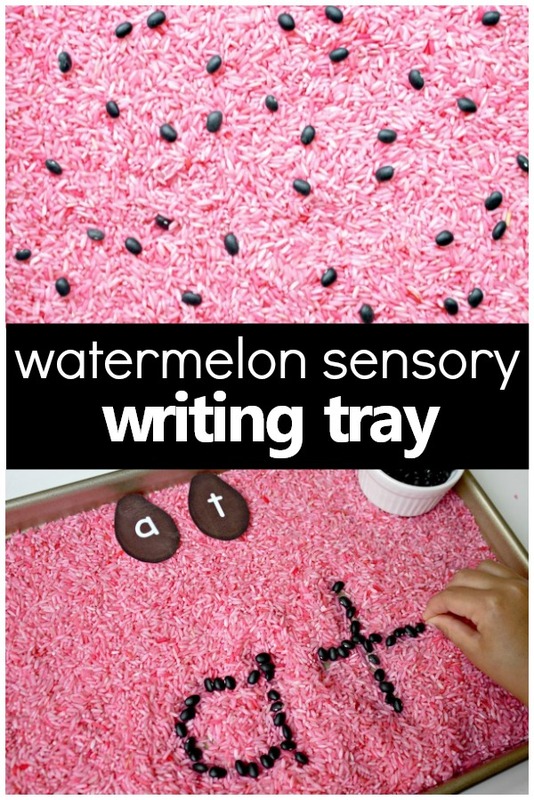 Next, sprinkle the watermelon “seeds” all over the tray. 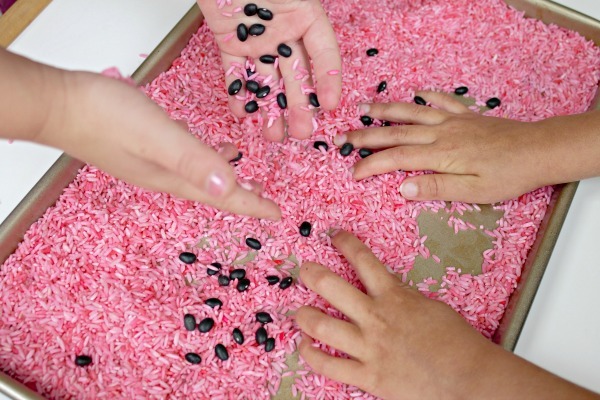 We made this a team effort and even took some time to let the rice and beans run through our fingers! This gave us time to discuss what we know about watermelon and give an overview of our new writing tray. Depending on the age and developmental level of your writers, you may choose to have them write letters or sight words. 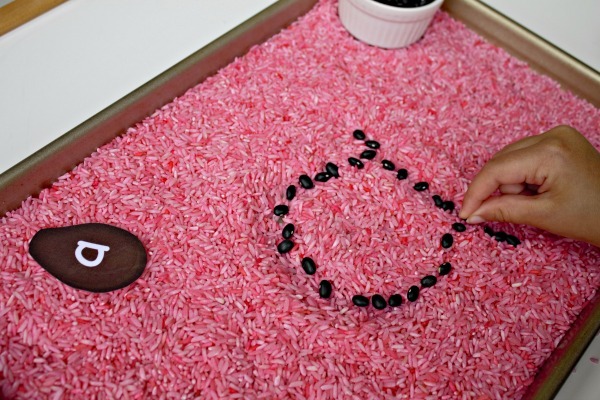 Using the letter seeds from our preschool watermelon learning theme packet, we set them out near the tray and began by writing letters in the rice tray. Small plastic letters or letters written on note cards would work well too. 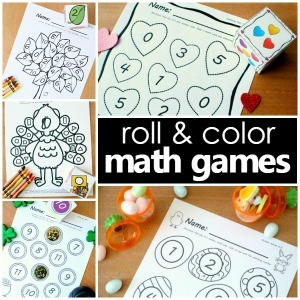 After the letter formation is complete, grab some watermelon “seeds” to trace over the letter. 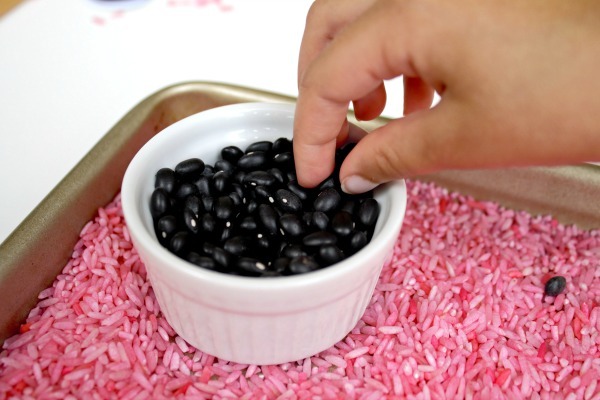 Pinching each black bean really helps flex those fine motor muscles! Carefully filling in the letter with the beans also lends some extra practice with letter formation. 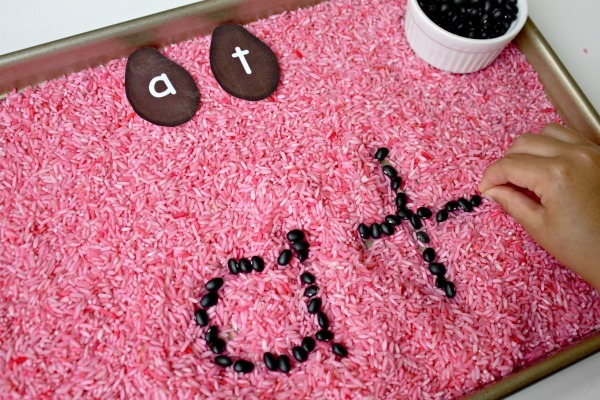 When students are ready to extend this writing tray activity, have them trace sight words into the rice. We began with short and basic words we have been working on. Using note cards with sight words written on them is another good option if you’d like to have the writing activity simplified. 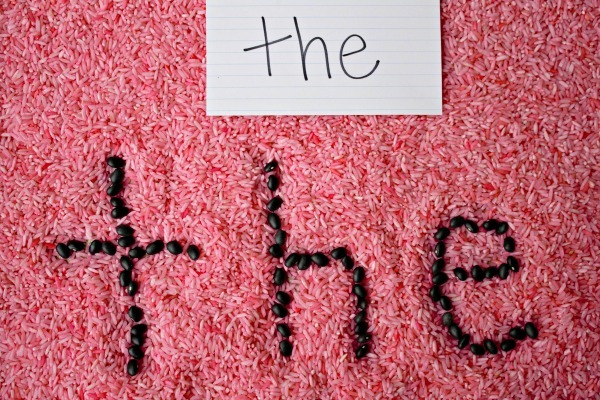 This gives children access to the correct spelling and formation of letters as a guide. We loved this hands-on approach to writing. It’s sure to be a quiet activity that we’ll revisit many more times throughout our watermelon theme!